This is my first post of two for today. Please check back later to see the latest Christmas card for Catch the Bug's Christmas in July challenges. This one is another card that is just die cuts - no coloring, no stamps or digital images, just a CAS application of die cut pieces. A little different from my usual style but one I like to do occasionally. It seems I've been on a binge of all-die-cut cards recently but I'm having fun. 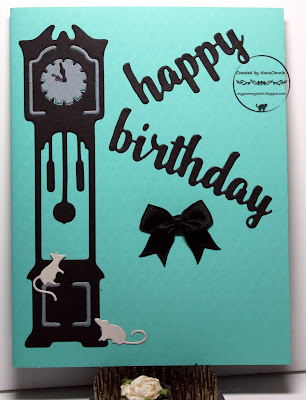 The grandfather clock die is from Die-versions (I used it twice to cut both black and steel gray CS,) the mice die is by Gina Marie, and the Happy Birthday sentiment was done with a Memory Box die. The bow is NOT a die cut; it's actually made from black, satin, ribbon and I used my bow maker to tie it. Such a fun card, Connie - thank you for sharing it with us at the Simon Says Stamp Wednesday challenge! What fun, and very cool that is all die cuts. That clock is really fantastic. Thanks so much for playing along at Time Out. What a fun card! You know I think I have that same clock die but I am not sure I have ever used it! Time to check! I love the tiny mice at the bottom and guess what? I have them too!! A funny card! Thank you for joining us at TIME OUT! I'm here with both my hats Connie, I love the simplicity of this card, great background card colour and love the silhouette of the clock etc. Thank you so much for joining us in our ATG challenge at Through The Craft Room Door this week. Looking forward to see you again next challenge. Cute card and great colors too! Thanks for sharing it with us at PIP Challenges!